Abstract: Mountain bike cycling is a very fascinating outdoor activity for those people who love adventures and thrills. The new released Airwheel C3 cool street bike helmet provides more comforts and pleasures for those mountain bike riders. With the smart Airwheel C3 helmet for extreme sports, mountain cycling riders are able to enjoy an even more pleasurable and exciting cycling. Airwheel C3 intelligent helmet is a newly released Airwheel product that improves the riding experience for all Airwheel and non-Airwheel riders. The brilliant design and intelligence of Airwheel C3 helmet for extreme sports is also a new favorite for those mountain bike cycling players and the Airwheel C3 intelligent helmet has become an unnecessary accessory for mountain bike cycling. Airwheel C3 cool street bike helmet works as a solid protection for those mountain bike riders. Riders are able to answer the call inside the helmet due to the function of Bluetooth wireless transmissions, which reduces the risk of answering phones calls during the riding. Moreover, the windshield has effectively protected riders’ eyes from the wind and small particulars, and this is important for riders to keep a safe and stable riding on mountain roads. 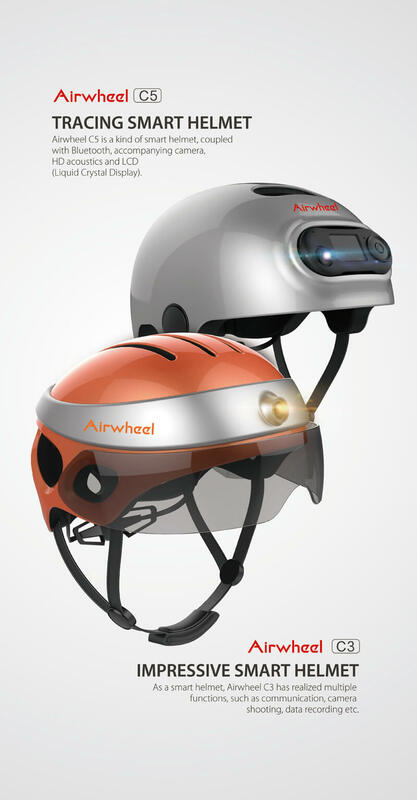 The Airwheel C3 intelligent helmet is able to take photos automatically during ridings because the high-tech helmet is equipped with a micro intelligent camera which can take photos intelligently, and this is really a fantastic function for mountain bike cycling because riders are able to record the beautiful scenery during the journeys. Apart from taking photos, Airwheel C3 color intelligent helmet can record video automatically and riders can easily capture the beautiful pictures during the riding activities. With the fashionable and high-tech Airwheel C3 intelligent helmet, riders are able to enjoy a different modern cycling with high-tech equipment and optimized design. Anyway, Airwheel C3 smart helmet is a brilliant Airwheel accessory that is benefits all riders in the world, greatly increasing the enjoyments for cycling. Previous：Win-win strategy: Airwheel self-balancing electric hoverboards appears in Serbia seminar.